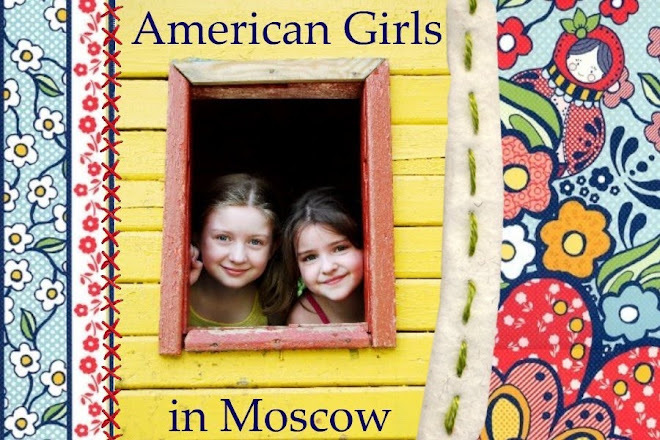 American Girls in Moscow: Before and After... Wow! So how did this magic happen? On Sunday Katya and I went with some of my students and volunteers with the organization "Maria's Children" to paint a mural at the orphanage and to simply spend time with the kids. They do this kind of activity throughout the year as one of the many ways the organization helps children in need. The other volunteers were amazing and they're a close-knit group. They were like SWAT team, organized down to the last detail, swooping in and pulling off the whole event. Some of the volunteers, mainly in their late teens-twenties, themselves grew up in orphanages and received help through Maria's Children. THAT is inspiring. After unloading all our supplies, we "checked out" the walls and interacted a bit with the kids as they finished their lunch. There were only 23 kids out of the 71 who live there year round; the others were away in the forest at a "dom otdikha." (Think something like a very basic scout/YMCA facility where you actually stay in a big building—and usually in an area surrounded by forests). It's really sad that only 10 of those children are actually orphans; the rest are there because either their parents didn't want them, or because their parents' rights were revoked because of neglect, abuse, etc. As a result, most of the kids there cling to the hope that they're only in an orphanage temporarily, and that their mother or father are coming soon... I couldn't help but wonder, what about the aunts? Uncles? Grandparents? Family friends? I just can't fathom that many kids being simply unwanted. That being said, I was very impressed by the director of the orphanage/school who greeted us. She's clearly a woman who give her heart and soul to these kids, striving to create a better future for them. 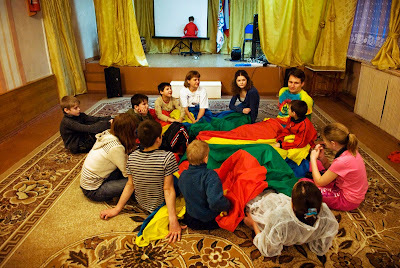 She's making a difference; some kids from this orphanage are moving on to brighter futures. They are challenged academically and athletically. That's why these murals will make such a difference in cheering the children up. Those who helped us to create them will be so proud whenever they're in that room; those who are away and will discover them as a surprise will feel special that someone cared enough to come and create them. I'm glad we painted the dining room; they're in there five times a day! Perhaps that will be five more times to smile? We started off with some pencil sketches. Ruslan, the leading artist in the group, works magic with a pencil and brush... At first the children just watched him, a bit in shock. As one boy kept saying, "Нельзя!!" It's forbidden! You can't draw on the wall! As he painted, he chanted to himself in a sing-song voice, "I'm breaking a schoooool rule... And nooooobody can punish me...!" It was so funny! We then dug in with the paint, encouraging the children to join us. I'm up on the ladder. Meanwhile, another mural was underway. On the opposite wall, children were busy painting planets, little by little. And we all enjoyed a MUCH-awaited snack. After 2 1/2 hours in the car and our time painting, we were so hungry! It was then time to play with the younger children; they're not able to paint for hours on end. 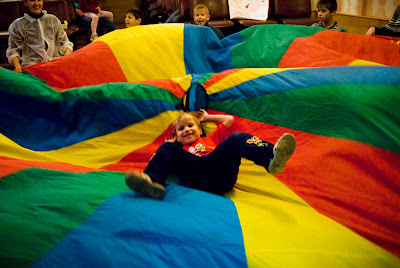 I brought my parachute to play games with them and it was a big hit! No one had ever seen one before, so people were quite curious. 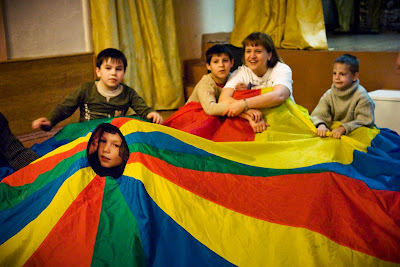 Playing with parachutes can be tiring, so we took a break to play some communicative games—telephone and "associations." As you can see, Katya was our resident photographer throughout. After about an hour and a half of play, we stopped to check on the murals—and look what we found! The actual painting up-close is FANTASTIC. I hope it will help the children to imagine what the future could hold. Meanwhile, the kids realized we would be leaving soon—and they conscientiously soaked up every last drop of affection. This little boy fell in love with my student... She was pretty happy, too! Yulia, the sweet little girl who "went swimming" on the parachute, actually cried when she saw the owl and she tried to run away from it. I then picked her up and told her how the owl was name "Anochka" (sweet Anya), and that she was there to make sure the children were OK—that they always have enough to eat, that they know they're special, and that... they eat their vegetables. I asked her to then find as many ladybugs as she could in the tree leaves, and there were four (I painted them). I told her there were four ladybugs because Yulia herself is four—and it's proof that the owl, the ladybugs and all the butterflies around the tree are her friends. She soaked it all up and was BEAMING by the end. It was just grand! We also had to be a bit creative in talking with cooks, convincing them that they aren't now wicked "Baba Yaga" witches—instead they are kind cooks who have come to rescue the orphans form a terrible fate at her hands. Even the cooks "ate it up"! We then got stuck in almost five hours of traffic on the way home... So what a LONG day... But, really, what a great one. 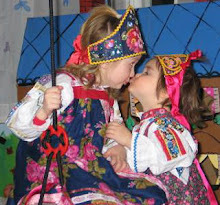 If you're in Moscow and want to join us some time, friend "maria's children" on facebook for the schedule of excursions. You can also call the studio directly to become involved in any number of ways! p.s. I just ordered a parachute online for Maria's Children to keep... Friends are coming from Michigan to visit us next week and they'll bring it. The kids will be so happy! p.p.s. Thanks to Oksana Yushko for some of these wonderful pictures! I wondered if Alla helped with this. She would not have shared this, but she is an AMAZING artist. I always loved the murals in our children's orphanages, and in fact, took photos to try and replicate them at home. Your work is gorgeous! And what a difference! So glad to see you posting on your blog! I've missed hearing from you the past few months. What a neat project. Makes my heart sad to see all the kids in the orphanage, but hopefully they will know they are valuable when they look at the art on the walls. The true meaning of Christmas in bringing joy to others and especially these children. I also find it hard to believe that these children don't have relatives to raise and love them. You all brought such happiness to the children. When I saw the first picture, I immediately said, "Baba Yaga". For your blog readers, this was one of my daughter's favorite books as a little girl. Her great aunt gave it to her. This is the same aunt that was reading a book with a Russian character named Tamara while I was pregnant and suggested the name to me. Aunt Eris, look what you started by just suggesting that name. My Aunt is looking down on us as we lost her a few years ago. I am so glad that your are back! And such a great project too. And Happy Birthday to Natasha! Thank you for sharing . . . AND I'm glad to hear from you again! I've missed you. The murals are fantastic! I need some Maria's children artists to come paint murals in my playroom. Wouldn't that be great! High quality stuff!! P.S. Is Ruslan the same boy I met at your house in Moscow? Oh, how wonderful. Thanks for sharing this. watching you snuggles made my heart smile, through my tears. What a great gift you gave those kids! Giving of yourself to others is the true spirit of Christmas! I am so glad you are back! I was worried! I even thought of you this morning and sent a prayer up. What a delightful day. it makes my heart so happy (yet sad). Thank you for sharing your love with others. Welcome back to blogging!! YEA! What a beautiful and inspiring day that you were part of for these children. What a blessing. It looked like a very rewarding day for everyone. Well Done!